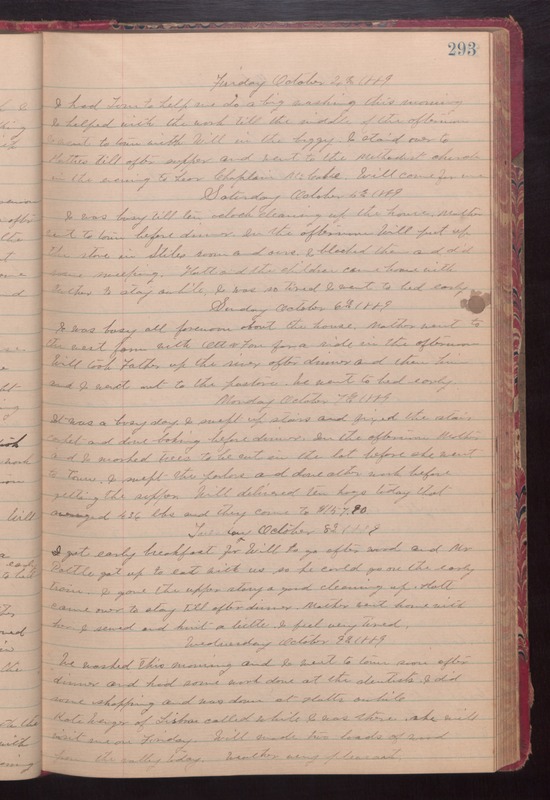 Friday October 2, 1889 I had Tom to help me do a big washing this morning I helped with the work till the middle of the afternoon I went to town with Will in the buggy. I staid over to Hatties till after supper and went to the Methodist church in the evening to hear Chaplain McCabe. Will come for me. Saturday October 3rd 1889 I was busy till ten oclock cleaning up the house. Mother went to town before dinner. In the afternoon Will put up the stove in Stiles room and ours. I blocked them and did some sweeping. Hatt and the children came home with Mother to stay awhile. I was so tired I went to bed early. Sunday October 4th 1889 I was busy all forenoon about the house. Mother went to the west farm with Ott & Fan for a ride in the afternoon. Will took Father up the river after dinner and then him and I went out to the pasture. We went to bed early. Monday October 7, 1889 It was a busy day. I swept up stairs and fixed the stair carpet and done baking before dinner. In the afternoon Mother and I marked trees to be cut in the lot before she went to town. I swept the parlors and done other work before getting the supper. Will delivered ten hogs today that averaged 436 lbs and they come to $157.90. Tuesday October 8th 1889 I got early breakfast for Will to go after wood and Mr Pottle got up to eat with us so he could go on the early train. I gave the upper story a good cleaning up. Hatt came over to stay till after dinner. Mother went home with her. I sewed and knit a little. I feel very tired. Wednesday October 9th 1889 We washed this morning and I went to town soon after dinner and had some work done at the dentists. I did some shopping and was down at Hatts awhile. Kate Wenger of Lisbon called while I was there she will visit me on Friday. Will made two loads of wood from the valley today. weather very pleasant.